ROSEMONT, IL - JUNE 08: Former Republican Presidential Candidate Herman Cain speaks to guests at the Conservative Political Action Conference (CPAC) at the Donald E. Stephens Convention Center on June 8, 2012 in Rosemont, Illinois. CPAC is being hosted by the American Conservative Union. A new Bloomberg poll puts Obama way out front of Mitt Romney 53 to 40 percent, with voters seeing the former Massachusetts governor as out of touch on the economy. As Taegan Goddard notes, the poll finds a plurality of Americans saying they’re better off economically under the president, a surprisingly strong number for the Obama team. The president’s re-election campaign isn’t letting up, though, coming out today with two new tough TV spots slamming “millionaire” Mitt Romney for shipping American jobs offshore. But does Mitt Romney have a chance for an upset in his boyhood home of Michigan? 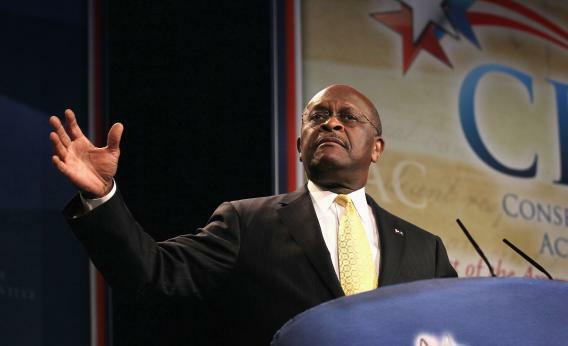 And Herman Cain will travel to battleground states this fall to bring out the Republican faithful.